I never used to be a big fan but The Viking is a coffee fiend and I guess it just rubbed off on me. I think if we were stranded on a desert island this would be the number one luxury item we couldn’t live without. It’s a total addiction and whilst I don’t consider myself to be a fresh coffee snob I have most definitely not drunk instant coffee for close to 10 years… Like all fresh products it needs to be kept in the fridge. I’m not really a brand queen when it comes to coffee and who needs to be when you can purchase the Sainsbury’s Taste the Difference, Fairtrade Columbian and the Co-opertive Fair-trade Ethiopian which are both very good indeed. There is only one Greek Yoghurt and that is TOTAL made by Fage. They do a few different varieties and i’m not fussy. This moth i’m all about the 0% which is perfection. I use it in so many things from scones to sauces to soups to smoothies to just eating it directly from the tub. It feels like a treat because it’s so thick and luscious and it peps up so many dishes yet I can also serve it alongside a slice of chocolate cake and it feels so sophisticated. I guess I could live without it but i’d be a very grumpy boy. bit of a tough call between this and cheese but cheese is such a large category and I can’t really rub cheese on my face for younger-looking skin. Ever since my good friend and ex-model Jenny told me that she keeps much of her beauty regime in the fridge i’ve been doing the same with my moisturiser. I don’t know entirely how true it is but I believe it lasts longer and there’s nothing better than applying a cool cream to your face in the morning… this Total Moisturiser by Benefit is truly brilliant and yes, I do work for them but I still choose to buy the stuff myself because I know results when I see them. Many people are un-aware they even do a skincare range but this stuff has one numerous awards. It’s super-thick and in fact I don’t use it every day so keeping it in the fridge extends its shelf life for sure. of course no Belleau Kitchen Top 5 would be complete without the chicken thighs… I haven’t always been cooking with them but since I discovered how inexpensive and tasty they were about a decade and a half ago i’ve never looked back. Chicken thighs are simply heavenly. They have an incredible balance of meat to fat ratio that’s not really found anywhere else on the bird and therefore take a long slow roast really well. They impart their gorgeous juices into any veg that you cook them with and you can serve up a pretty impressive, filling and tasty one-pot meal with very few ingredients in the house. All the major supermarkets sell them in packs and they really are so cheap you can afford to buy the best quality free-range chicken, so no excuses… make sure they’re skin-on and bone-in for extra flavour… and of course I have over 25 chicken thigh recipes on my blog! and there you have it… I wonder what your top 5 fridge essentials are? I love LOVE your note to the PRs out there – I don't get that many 'offers'/approaches, but after receiving another “Dear author, We found your blog very interesting. We would like to offer you to test ” email, frankly, it makes me want to scream… Good list. You use far more classy moisturiser than I – maybe I'd get better results if I kept my cheap stuff in the fridge. I'd have to have chorizo on my list – and cheese (all cheese). thanks Sally… i don't usually mention PR but I was so impressed as like you, most of them make me want to be violent!… yes to cheese but as I say, that's a whole other post! Wow, you found a gem of a PR there! I'm still getting the “I'm a big fan of your blog” emails about the Grapevine blog which, if they were real fans, they'd have noticed was last updated over 7 months ago. Anyway, on to my top 5. Milk – can't live without tea, and it has to have skimmed milk in it. Lemons – used in so many dishes of all kinds, and also in tea if the milk runs out. Yogurt, chicken thighs and free-range eggs-check! Coffee? We drink a lot of coffee and purchase whole beans and grind as we use so we don't refrigerate. Hmmm, moisturizer? O.K., I'm game. Into the refrigerator with it. I can use all the help I can get. oh go on… pop it into the fridge and see the results! I know!! !… I think we have to take things like milk, butter and cheese as a given… but agree about the carrots, they're always in there! My top 5, if we're taking milk, butter and cheese as a given, are eggs, chorizo, full fat yogurt, mayonnaise and goose (or duck) fat. I definitely have to agree on the eggs & yogurt, although I no longer keep my eggs in the fridge so couldn't include them. Love the not to the PR & agree on that too! ahh yes, prosecco, of course! chorizo is a popular choice and is like a meat and a herb in one… I had considered putting mayo on the list too! Thanks… I know, i'm still very much in the 'eggs in the fridge' camp but what can you do! Yo Dom, you tell em ???? 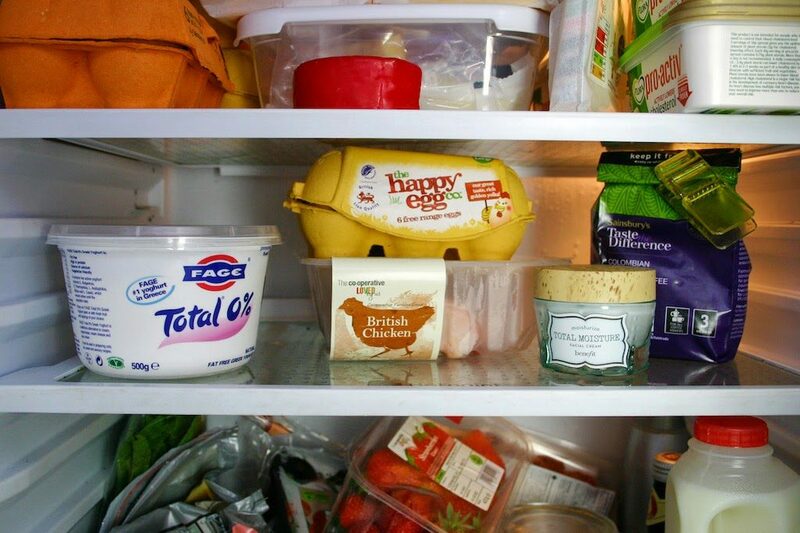 I've never kept my eggs in the fridge, so couldn't include those, but yoghurt is a must as is cheddar cheese, mayo, open jar of chutney (mine of course) and lettuce. Mmmmmmmmmm….. all the usuals – but I also like to have bacon, tomatoes, tomato paste coconut oil and yes carrots! There's something pleasingly voyeuristic about looking in other people's fridges and yours always looks so neat and tidy ! I always thought keeping coffee in the the fridge was a huge no-no because of the moisture, changes in temperature when you keep opening the door and the fact that it absorbs smells from all the other foodie stuff in there ? Maybe it's as divisive as the eggs though ! I wish all PR's could see your last paragraph Dom! My fridge essentials are usually milk, grape juice, butter, I can't believe it's not butter and american mustard – strange combo I know! !